A rein attachment with elastic built in. How does it work? The short piece of elastic stretches to a particular length, over and over again during the horse's work. Since it is not rigid, it allows an elastic connection between the mouth and hands. When the horse becomes resistant or heavy in the hand, the elastic stretches and flattens a control loop of leather, creating a "normal" rein. 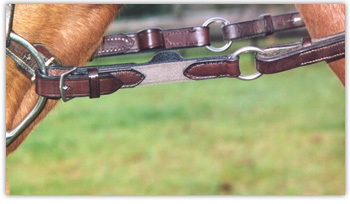 When the horse yields to the contact, the elastic effect returns and provides a softer contact.